Chief Information Officer (CIO) is a job title commonly given to the person in an enterprise responsible for the Information Technology and Computer Systems that support Enterprise Goals. As Information Technology and Systems have become more important, the CIO is considered to be the key contributor in formulating strategic goals for an organization. Another way that the CIO role is changing is an increased focus on Service Management. As SaaS (Software as a Service), IaaS (Infrastructure as a Service), BPO (Business Process Outsourcing), and other more flexible value delivery techniques are brought into organizations, the CIO usually functions as a 3rd Party Manager for the organization. In essence, the CIO in a modern organization is required to possess both business skills and the ability to relate to the organization as a whole, as opposed to being a technological expert with limited functional business expertise. The CIO position is as much about anticipating trends in the market place with regards to technology as it is about ensuring that the business navigates these trends through expert guidance and proper strategic IT planning that is aligned to the corporate strategy of the organization. Whether it is a large organization or a small to mid-sized setup, technology has become an underlying requirement for any business to efficiently streamline business activities, provide a faster turnaround time, increase profits and lower the overall cost of operations. However, for the technology to perform at its optimal level, the new IS organization requires a strong leadership and a clear vision aligned with the business goals. At this point, it is not about the best hardware/software or the network, but the CIO’s role is clearly envisioning the technology plan from a business standpoint and accordingly devising the Enterprise Architecture. Such leadership requires an experienced Information Architect who understands technology and is well versed in business management. 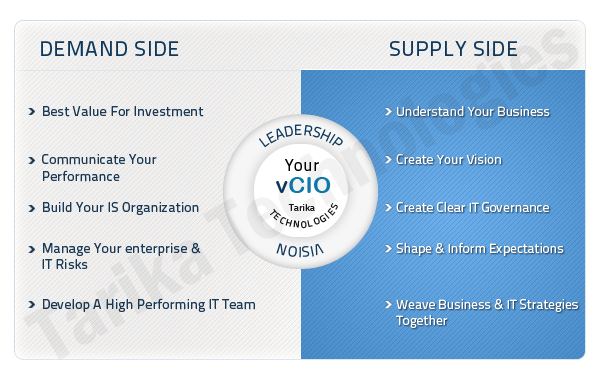 We, at Tarika Technologies, follow the 80-20 rule and, with experience, have realized that a CIO spends about 80% of his/her time on business strategy and approximately 20% from a technical standpoint. On the other hand, the role of a Chief Technology Officer (CTO) is reversed; 80% or more of his/her time is spent solely on developing new technologies to expand corporate technological capabilities and the remaining 20% or less on business. When both positions are present in an organization, the CIO is generally responsible for processes and practices supporting the flow of information, whereas the CTO is generally responsible for the technology infrastructure. In small to mid-sized organizations, generally the role of a CIO and CTO is managed by a single person well versed in both Business & Technology. While the larger organizations can justify the overall ROI (Return on Investment) of a full time in-house CIO, affordability in small to mid-sized organizations for such talent remains a huge challenge. Therefore, the tasks of technology management are generally passed on to people with minimal knowledge about technology. 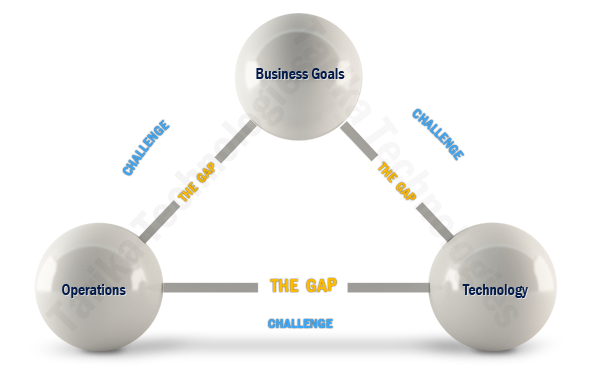 This gap in Business and Technology is the fundamental root of all problems such as inadequate technology architecture, increased cost in technology infrastructure support, and lowered efficiency, among many others. Tarika Technologies exists to address this challenge for the small to mid-sized organizations by appointing a virtual CIO, where the primary focus is on bridging the gap between business and technology. The appointed CIO follows our custom developed processes in managing and laying out the business and technology integration plan. In addition to providing such services, a dedicated team is setup to support the IS department to include network support, hardware/software support, custom developed applications, and full on-going support. Most of our clients like to call us their “in-house” technology team. AS YOUR VIRTUAL CIO, WE HAVE OUTLINED SOME POINTS TO FURTHER BREAK DOWN THE SERVICE OFFERINGS.